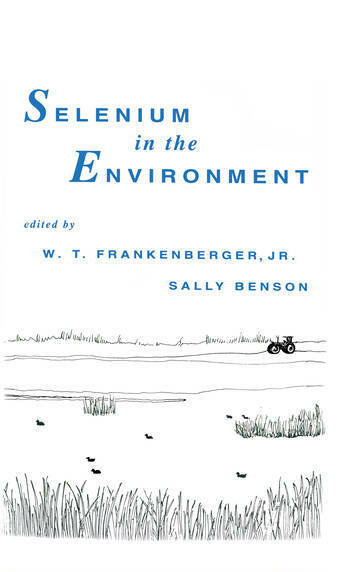 Discusses the biochemical and geological cycling of selenium (Se), its worldwide distribution, and the factors controlling its fate and transport within and between major environmental media, presenting a global assessment of selenium's complex environmental behaviour. The focus of this work is upon Se management and remediation strategies. Global Importance and Global Cycling of Selenium; Selenium Deficiencies and Toxicity; Adsorption, Volatilization, and Speciation of Selenium in Different Types of Soils in China; Kesterson Reservoir - Past, Present, and Future - An Ecological Risk Assessment; Field Investigations of Selenium Speciation, Transformation and Transport in Soils from Kesterson Reservoir and Lahontan Valley; Geologic Origin and Pathways of Mobility of Selenium from the California Coast Ranges to the West-Central San Joaquin Valley; Distribution and Mobility of Selenium in Groundwater in the Western San Joaquin Valley in California; Chemical Oxidation-Reduction Controls on Selenium Mobility in Groundwater Systems; Kinetics of Selenium Uptake and Loss and Seasonal Cycling of Selenium by the Aquatic Microbial Community in the Kesterson Wetlands; Agroforestry Farming System for the Management of Selenium and Salt on Irrigated Farmland; The Algal-Bacterial Selenium Removal System: Mechanisms and Field Study; Accumulation and Colonization of Selenium in Plants Grown in Soils with Elevated Selenium and Salinity; Vegetation Management Strategies for Remediation of Selenium-Contaminated Soils; Selenium Volatilization by Plants; Microbial Volatilization of Selenium from Soils and Sediments; Biochemical Transformations of Selenium in Anoxic Environments; Biochemistry of Selenium Metabolism by Thauera Selenatis gen. nov. sp. nov. and Use of the Organism for Bioremediation of Selenium Oxides in San Joaquin Valley Drainage Water. ". . .excellent, well presented and comprehensive. " ". . .a treasure of information. "